Use this screen to add categories and items for use in external interface. A fresh OTRS installation doesn’t contain any categories or items by default. The catalogue management screen is available in the Customer Service Catalogue module of the External Interface group. This module consists of two management screens: a category management screen and an item management screen. Use this screen to add categories to collect the same items into groups. The Category Management screen in available via the Go to category management button or via the Category Management module. Click on the Add Category button in the left sidebar. Click on a category in the list of categories. Click on the trash icon in the Delete column of the overview table. If several categories are added to the system, use the filter box to find a particular category by just typing the name to filter. It is possible to add the new category under an existing one as sub-category. This will be displayed as Parent Category::Child Category. Select a language from the available languages of the system. Use this screen to add items to the catalogue. Items can be collected into categories. 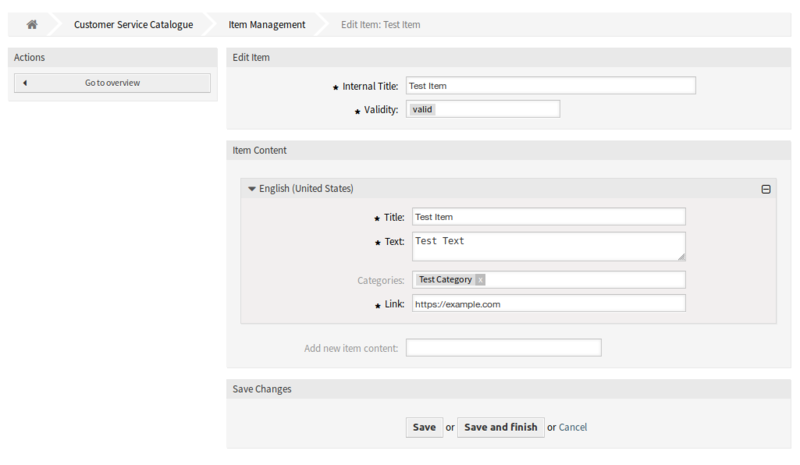 The Item Management screen in available via the Go to item management button or via the Item Management module. Click on the Add Item button in the left sidebar. Click on an item in the list of items. If several items are added to the system, use the filter box to find a particular item by just typing the name to filter. One ore more categories can be selected for the item in which the item should be visible. Only those categories can be selected, that have the same language as the selected language for this widget. A link to an internal or an external URL.